Clearwater Florida – Many of you have read my articles explaining Florida Real Estate Property taxes for Tampa Bay homeowners and the changes Amendment 1 brought about. If you or anyone you know bought a home or condo in Florida and moved from one homesteaded property to another in 2007 then please listen up, you’ve got to act fast to benefit from the new property tax portability benefits of a 3% cap on your new Tampa bay property as well as trasferring some property tax equity. This could save you thousands of dollars this year and every year after. How big of a difference does it make – we know someone who downsized before we had Amendment 1 in 2006 and they sold a $400,000 home and bought a $200,000 home and their taxes doubled (so really they went up 4 time since portability didn’t exist) and that translated into about $2000 a year more they will pay in property taxes FOREVER. Don’t let this happen to you. What’s the Property Tax Portability filing process? and if you are a resident alien bring your green card too. 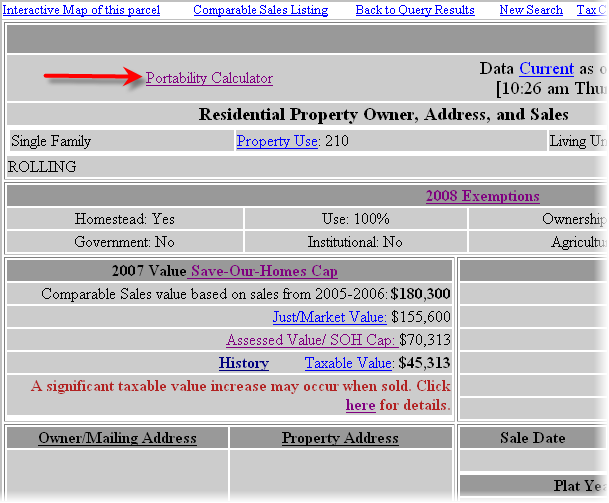 How do I find out more information about Tampa Bay Property Taxes? Pinellas County Property Appraiser’s Office: (727) 464-3207 or pcpao.org. Hillsborough County Property Appraiser’s Office at (813) 272-6100 or hcpafl.org. It’s still a home buyers market so if you are looking to buy property – check out the Tampa Bay MLS and see all the Tampa Bay real estate for sale right now. Good information Cyndee! We have been blessed here in Alabama over the past several years by people moving out of your area to escape the high property taxes. This just might stem the tide a little. Charles – it’s a start! It seems our governments are finally listening. Cyndee – keeping the public posted on current tax issues certainly lets them know you are the local expert – great job informing your clients both past and future. Thesa – thanks for stopping by – we’ve had lots of changes and it’s important for people to be up-to-date. Thanks for the info 🙂 Was thinking about moving to the area and will factor this in. Hello Cindy, it’s nice to know how taxes work in Tampa Bay. Seems like it might be cheaper to live there than Los Angeles. From what I’ve seen you can buy a lot more with less Property taxes. My wife and I have been discussing retirement there (and a few other places), and have found that some places may appear to have less expense, but have higher taxes that people in real estate don’t always mention. Taxes are something to really look at before getting involved in the real estate in any area. So many wanted this tax law were happy when it passed. It will help so many and I hope this will start some people upsizing and downsizing and moving around soon. We have alot of inventory of homes in Florida and at a great price so it will be a good deal for this group of people looking to buy this year. Many people buy homes in both Florida and Georgia and go back and forth between the two with the season. Any tax savings is a good thing. I think people will like having an tax advantage they can get. Portability is a good one and I see many people as families grow moving to a bigger house and as they retire going to a smaller house. This is a tax law that works for all. I hope this portability will create some movement in the market. I am sure Florida will rebound people love to vacation and live in Florida and when they have the money and time is right they come. It is the number one vacation destination in the world! Need I say more! I saw a blog yesterday and saying that in Miami the portability was a big player in the sales they are receiving and the first I have seen another site talking about the portability other than your post. Many homeowners hope the next bill up for approval which increases sales tax by one percent and giving homeowners a 20-35 percent cut in there house taxes will pass and offer another assist in rocketing taxes for homeowners. I see it as another reason to buy right now many homeowners are enjoying reduce price, low intertest rates and portability and now if this passes reduces house taxes. This will attract many to Florida and many to stay in Florida. Cyndee this is great information you are passing on to consumers. I am sure there are plenty of people that don’t have a clue about this. Looks like you could be saving a few bucks for some folks! Really great informative article about taxes and how the timing of your tax return can have large implications. Most consumers are rather clueless when it comes to topics like this so it’s good to see a blog that offers such helpful information. I’ll definitely tell people I know to come check this site out it’s really informative!